Although the Glossier showroom was at the top of my list of beauty spots to hit in New York, in between all the food we ate and the snow, we didn't end up going until the last day it was due to be open (it was initially a pop-up installation). However, it's now set up shop permanently, which means I can go back in September! Here are my thoughts on my first visit. If you don't know Glossier, then er, where have you been? Glossier is the brand that every tween, 20-something (and older, me included) is spending on right now, thanks to it being extremely on-it when it comes to knowing what customers want. Any new trend that we're remotely considering, Glossier is in there first; any product that we've worn forever but could do with a revamp, Glossier gets to it and does it well. 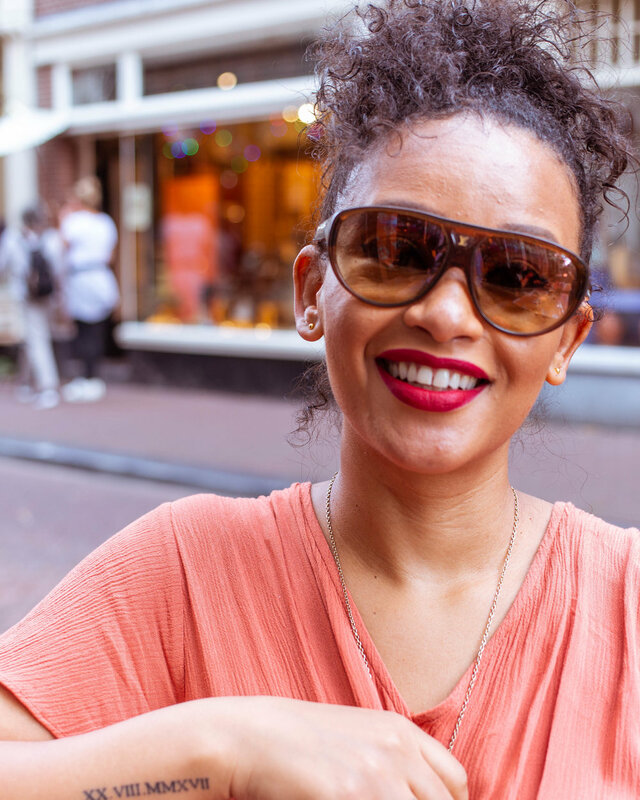 Let's face it, we all probably own a lipgloss, lip balm or a brow product, but Glossier seems to make it more fun. The brand itself is a product of the love and attention owner Emily Weiss, gave to her website, intothegloss.com, which launched in 2010. The site swiftly became known as the place to go when you needed skincare, makeup and hair product advice and information. Four years later Glossier emerged as the brand that would give us products created with the backing of in-depth knowledge from beauty editors and experts. If, like me, you've been sat watching the Glossier explosion from somewhere other than the US, you've no doubt pined and moaned about the fact that Glossier doesn't have a store in your town. 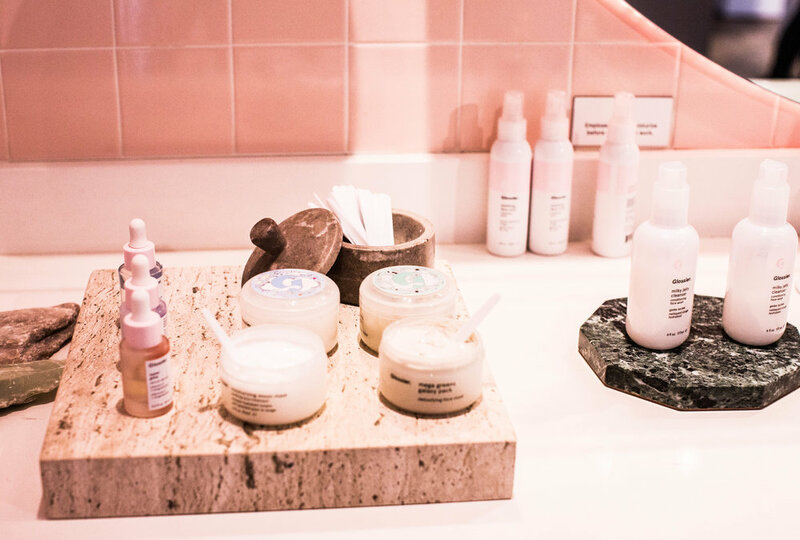 The brand has had great success with international pop-ups but the New York Glossier Showroom is the first time it has put down permanent roots. We popped in there to have a sniff of Glossier You - the brand's first foray into perfume - and of course, to take some pix. We were slightly overly keen on the day - we arrived about 40 minutes ahead of opening, in the drifting snow. We camped out at a cafe opposite but headed across the road with a couple of minutes to spare before it opened at 11am. Except it didn't. Yes, it only opened like, 10 minutes late, but when it's cold, and you've travelled and you're made to wait in a doorway with staff not telling you why it isn't open yet, it gets a teeny bit annoying. I know that might sound bratty. To be honest, I think I noticed it so much because the staff just weren't communicating; they were obviously putting together either purchases or gift bags for people, but all they had to say was 'hey guys, we're running a bit late, please be patient' and give us a tiny bit of eye contact or, dare I say it, a smile, and we'd probably have been appeased. We're that easy! I actually asked if there was a problem, to break the silence and the girl basically just gave me an awkward shrug. Then a voice whispered something about the lift being in use. All that being said, I totally appreciate and respect what Glossier and Emily, in particular, has done. It's a brand that speaks to so many women and men and seems to be 100 percent committed to showing a diverse community. I think I've listened to almost every podcast Emily has been featured on, and read every article about the brand because I believe it has staying power. I will visit again in September, now that the Glossier Showroom is permanent, but I won't be going in there hoping for advice and attention. I'll just look after myself and finally try Boy Brow and probably spend a ton of money anyway. Have you been to the Glossier Showroom? Did you love it? Let me know in the comments below! And feel free to let me know of any other beauty must-do's in New York.